26 Stalls, all 12'x12', gravel base, rubber mats & bedded with sawdust. 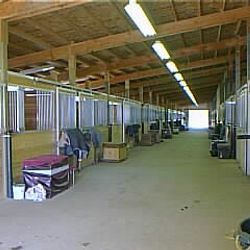 16+ Stalls have access to sand paddocks 65' in length. We leave approximately 10 stalls available exclusively for horse show and clinic use. Extra wide aisleway (16') allows client to have tack box by their stall for convenience. Horse Shower Stall with hot/cold water. Feed Room for sacked feed and supplements. 2 Tack Rooms and 2 Grooming Stalls. Indoor Arena 100' x 200' with sand, rubber and fabric footing, and open viewing area. PA System for teaching and horse show/clinic use. Farrier Station doubles as a 3rd Grooming Stall. Shavings Bin with blanket hangers (blanket drying racks). Fly Guard overhead fly system (April-October). Storage Area for Jumps, dressage ring surround, truck/trailer, hay & implements. 7 Stalls, 5 with access to sand paddocks 65' in length. Shavings Bin, Hay and Grain Storage. Daily Turn Out: Everyday ALL DAY, rain or shine (unless they shouldn't be. ie: ponies/spring grass*). 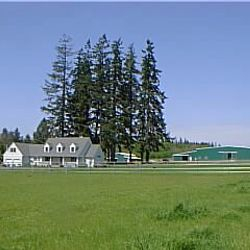 20 Grass Pastures: (8) 1.5 acres, (9) 2-2.5 acres & (3) "Postage Stamp" Diet Pastures* for easy keepers! Log jump & Telelphone Pole Jumps including hogs back. Shavings trail around the perimeter of the property is a great warm up, cool down or social ride. Orchard apples, pears, plums & walnuts for equine and human consumption! Access to trails on neighboring properties.